Our guide to the surviving Out of the Unknown clips has been updated with a number of new images (specifically frame grabs from Little Black Bag, a shot from The Naked Sun and Radio Times billing for The Uninvited). The guide can be found here. 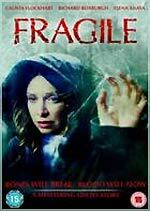 Lionsgate will release Jaume Balagueró's Frágiles (as Fragile) on DVD on July the 2nd. The film, a ghost story about the mysterious events at a dilapidated children's hospital on the Isle of Wight (that is, a dilapidated hospital for children, not a hospital for dilapidated children), stars Ally McBeal's Calista Flockhart and Van Helsing's Dracula. Richard Roxburgh. The film will be presented in anamorphic 2.30:1 format, with Dolby Digital 5.1 audio (at 448kbps) and optional English subtitles. The disc will also contain a seven-minute Making of... featurette. The RRP is £15.99. (Sendit.com currently have a good pre-order price: £9.89). 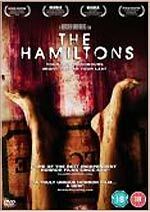 Lionsgate will also release the award-winning horror film The Hamiltons on DVD on July the 2nd. The film is about a twisted group of siblings who move into a new town, heralding a series of mysterious disappearances. It will be presented in anamorphic 1.78:1 format, with Dolby Digital 5.1 audio (at 448kbps) and optional English subtitles. The disc's bonus features are a commentary track (with up-and-coming directors The Butcher Brothers and actor Cory Knauf) and deleted scenes (8m). The RRP is apparently £17.99. Again, Sendit.com currently have a good pre-order price: £9.89. Fantom Films is releasing a DVD celebrating popular children's TV series T-Bag this autumn. The T-Bag Reunion DVD features interviews with cast members Elizabeth Estensen, Georgina Hale (T-Bag), Kellie Bright (Sally Simpkins), John Hasler (T-Shirt), Jennie Stallwood (Deborah), Jim Norton, Murray Melvin and Matt Zimmerman, and contributions from directors Glyn Edwards and Neville Green, writers Lee Pressman and Grant Cathro, and costume designer Ray Childe. It will feature behind-the-scenes photo's and video footage, and original props and costumes, (but no, alas, any episodes of the series itself). The disc can be pre-ordered from the company's website for a special price, saving £5 off the £14.99 RRP. Tartan have announced the details of their 23rd of July DVD release of the 1922 classic Haxen - Witchcraft Through The Ages. 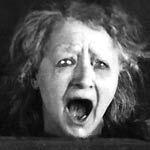 The disc will include the original 1922 version, with a choice of three soundtracks: the original, or one of two new scores (one performed on the hammer dulcimer by composer Geoff Smith; the other a "dynamic electro-acoustic" by UK group Bronnt Industries Kapital). The disc will also feature the shortened 1968 version, which had a narration by William Burroughs and a jazz score by Jean-Luc Ponty. The film will be presented in its original Academy ratio. The RRP is £19.99. Time to catch up with some recent soundtrack releases from specialist label Film Score Monthly! The label often releases scores from films of questionable artistic merit: they’re just concerned with the quality of the score. Thus many mostly-forgotten movies are briefly resurrected from the archives, are scrutinized by FSM’s sleeve note scholars, and then slip back into obscurity. In the process the label occasionally unearths films that surely demand to be re-appraised, if only to confirm that they are indeed as awful as they appear on paper! 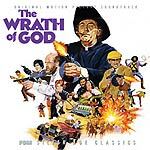 I defy anyone not to want to see The Wrath of God after seeing the glorious poster artwork used as the CD cover. It depicts Robert Mitchum, dressed as a Night of the Hunter-style preacher, chomping a cigar, and wielding a blazing Thompson submachine gun. And a man with a whip. And a huge explosion. And a woman with more cleavage than seems possible outside of a Russ Meyer movie! The 1972 film, which also features Frank Langella, Batman’s Victor Buono and Straw Dogs’ Ken Hutchinson, was set and shot in Mexico. It also marked Rita Hayworth’s swansong (reports from the set hinted of the first symptoms of Alzheimer’s disease, which would claim her life fifteen years later). The film was lightly scored by Lalo Schifrin; a natural choice given his Latin heritage. The composer delivers a diverse score, with plenty of Mexican flavour. Although the film is set in the 20s, Schifrin gives the music a characteristic up-to-date feel. The score boasts a wide array of instrumentation, including a cimbalom, French horns, flute and solo guitar. The disc features the complete score (running just under fifty-minutes), and a handful of bonus cues, all in stereo, taken from the 35mm three-track masters. The sleeve notes are by Jeff Bond and label head honcho Lukas Kendall. Two albums released on LP on the Colpix Records label make for a smart double-bill, pairing Clifton Parker’s seafaring adventure score for Damn The Defiant! (released here in the UK as H.M.S. Defiant) with Maurice Jarre’s score for Fred Zinnemann’s historical drama Behold A Pale Horse. Both scores are presented complete, mastered from pristine copies of the original Colpix vinyl (the masters are lost). Two tracks have been added to the Behold A Pale Horse LP's track-list, taken from a rare mono French Colpix EP. 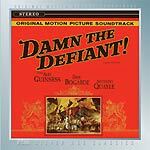 The score for 1962’s Damn The Defiant! reunited the composer with the director of Sink The Bismark!, Lewis Gilbert. FSM’s CD replicates the original album, which stretches about twenty-minutes of material into nearly half-an-hour. A few more minutes of music was recorded for the film, making the CD an almost complete representation of the score. Lukas Kendall’s track-by-track notes deftly unravel the LP’s curious sequencing. Behold A Pale Horse, Zinnemann’s 1964 film about the Spanish Civil War, starred Gregory Peck. It also featured Anthony Quinn and Omar Sharif (who, like the film’s composer, were still basking in the praise lavished on Lawrence of Arabia). Refused permission to film in Spain because of the movie’s subject matter, the film was shot in the Basque region of France. The Spanish government retaliated by banning the film – and other Columbia films in circulation at the time, including Lawrence of Arabia - causing the studio considerable financial loss. Jarre’s score is in stark contrast to the bombast of Lawrence of Arabia, though. Small and intimate, the score features Spanish guitar, harp, harpsichord and woodwinds. The film is another that features little music and, once again, the Colpix album plays fast-and-loose with the sequencing to pad out the running time. FSM’s CD adds two tracks from a French EP: an alternate version of the Exile March main theme, and Spain Regained, a symphonic melody of the film’s secondary themes. April’s other FSM release is one that will probably appeal more to fans of Lucille Ball as it will to fans of film music. 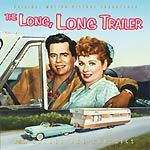 The Long, Long Trailer and Forever, Darling were two cheesy romantic comedies that partnered Ball with co-star Dezi Arnaz, and traded off the formula established by their enormously popular sit-com, I Love Lucy. Both films were distributed by M-G-M, and both included vocal contributions from the stars. FSM’s disc marks the debut of both scores: one by Adolph Deutsch, the other by Bronislau Kaper. Deutsch, who was born in London, had a background in Broadway and dance bands, as well as experience scoring movies for Billy Wilder, so was well-suited to The Long, Long Trailer, a frothy comedy about a young couple living in a caravan. The disc includes the complete soundtrack (just under twenty-five minutes), mastered from he original 35mm three-track recordings. There’s a lovely photo of Bronislau Kaper in the disc booklet that makes him look like he wouldn’t be out of place in an episode of Bewitched. The breezy 1956 comedy Forever, Darling was a developed as a vehicle for Ball and Arnaz by their production company, Desilu, from a script plucked from M-G-M's vaults. The score demonstrates Kaper’s talents for melody and harmony, which are encapsulated in the title song, which was later released as a single (this version is not on the CD). The disc includes forty minutes of music from Forever, Darling, taken from the mono 17.5mm magnetic film tracks, with an additional quarter of an hour of bonus cues. 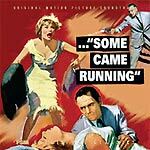 Saving the best till last, Vincente Minnelli’s Some Came Running, about a young man (Frank Sinatra) returning home from war, earned five Oscar nominations, including one for Jimmy Van Heusen and Sammy Cahn’s song To Love And Be Loved. (The film lost out at the Academy Awards to another Minnelli film, Gigli). The film also featured Dean Martin and Shirley MacLaine, and is generally acknowledged as being the beginning of the Rat Pack era of movies. The film's score was written and conducted by Elmer Bernstein, who had recently worked with Sinatra on The Man With the Golden Arm and Kings Go Forth. Bernstein gave the film a jazzy Americana spin, which must have been something of a hand-brake turn so soon after working on The Ten Commandments. Bernstein’s score earned widespread praise, and a coveted Laurel Award, in 1959. The score has been available on CD before (from David Wishart’s Cloud Nine Records), but that was a presentation of a re-recording made by Capitol. Lukas Kendall’s sleeve notes mention that the original Some Came Running tapes would have been released much earlier, if it hadn’t been for an error in the original recordings which meant that, for part of the recording, one of the three tracks was missing. Thankfully, Bernstein kept quarter-inch mono mixdowns of almost the entire score, which has enabled much of the score to be presented on CD in stereo. A handful of cues have been ingeniously culled from other sources, enabling the disc to offer the complete score (including an instrumental version of To Love And Be Loved). Some Come Running, The Long, Long Trailer / Forever, Darling and The Wrath of God are limited edition releases, of three thousand copies each. As usual, the discs come with illustrated booklets containing detailed track notes. The discs are available from various specialist retailers, including FSM’s trading partner, Screen Archives Entertainment. believed wiped until unearthed by Kaleidoscope. series including Callan, The Haggard Falcon, Mystery and Imagination, The Bill and numerous notable one-off plays discusses his prolific career. by Terence Feely, starring Windsor Davies and Michael Robbins. the Raiders of the Lost Archive campaign. Stephen Poliakoff and directed by Mike Vardy. starring Patrick Malahide and directed by Mike Vardy. 15:00 - Justice is a Woman - the original pilot play for the later television series Justice, starring Margaret Lockwood, Iain Cuthbertson and John Laurie. 17:00 - Between the Covers - Robert Hardy stars in a Scottish Television play from 1980, written by Robert Banks Stewart and directed by Mike Vardy. from its original 405-line VT.